While a federal agency, the RCMP also provides direct policing to dependent territories. The Royal Canadian Mounted Police (RCMP; French: Gendarmerie royale du Canada (GRC), "Royal Gendarmerie of Canada"; colloquially known as the Mounties, and internally as "the Force") is both a federal and a national police force of Canada. The RCMP provides law enforcement at a federal level in Canada, and also on a contract basis to the three territories, eight of Canada's provinces (the RCMP does not provide provincial or municipal policing in either Ontario or Quebec), more than 150 municipalities, 600 aboriginal communities, and three international airports. The Royal Canadian Mounted Police (RCMP) was formed in 1920 by the merger of the Royal Northwest Mounted Police (RNWMP, founded in 1873) with the Dominion Police (founded in 1868). The former was originally named the North-West Mounted Police (NWMP), and was given the Royal prefix by King Edward VII in 1904. Much of the present day organization's symbolism has been inherited from its days as the NWMP and RNWMP, including the distinctive Red Serge uniform, paramilitary heritage, and mythos as a frontier force. The RCMP/GRC wording is protected under the Trade-marks Act. RCMP in Quebec City on St. Patrick's day, 2014. As Canada's national police force, the RCMP is primarily responsible for enforcing federal laws throughout Canada while general law and order including the enforcement of the Criminal Code and applicable provincial legislation is constitutionally the responsibility of the provinces and territories. Larger cities commonly form their own municipal police departments. 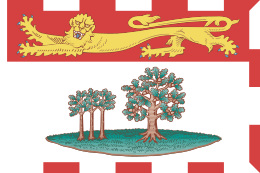 The two most populous provinces, Ontario and Quebec, maintain provincial forces: the Ontario Provincial Police and Sûreté du Québec. The other eight provinces contract policing responsibilities to the RCMP. The RCMP provides front-line policing in those provinces under the direction of the provincial governments. 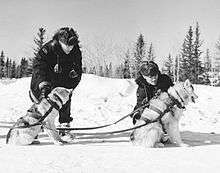 When Newfoundland joined the confederation in 1949, the RCMP entered the province and absorbed the then Newfoundland Ranger Force, which patrolled most of Newfoundland's rural areas. The Royal Newfoundland Constabulary patrols urban areas of the province. In the territories, the RCMP is the sole territorial police force. Many municipalities throughout Canada contract to the RCMP. Thus, the RCMP polices at the federal, provincial, and municipal level. It is the only police force of any sort in several areas of Canada. The RCMP is responsible for an unusually large breadth of duties. Under their federal mandate, the RCMP police throughout Canada, including Ontario and Quebec (albeit under smaller scales there). Federal operations include: enforcing federal laws including commercial crime, counterfeiting, drug trafficking, border integrity, organized crime, and other related matters; providing counter-terrorism and domestic security; providing protection services for the Monarch, Governor General, Prime Minister, their families and residences, and other ministers of the Crown, visiting dignitaries, and diplomatic missions; and participating in various international policing efforts. Under provincial and municipal contracts the RCMP provides front-line policing in all areas outside of Ontario and Quebec that do not have an established local police force. There are detachments located in small villages in the far north, remote First Nations reserves, and rural towns, but also larger cities such as Surrey, British Columbia (population 468,251+). There, support units investigate for their own detachments, and smaller municipal police forces. Investigations include major crimes, homicides, forensic identification, collision forensics, police dogs, emergency response teams, explosives disposal, and undercover operations. Under its National Police Services branch the RCMP supports all police forces in Canada via the Canadian Police Information Centre, Criminal Intelligence Service Canada, Forensic Science and Identification Services, Canadian Firearms Program, and the Canadian Police College. Single-Handed by Charles Marion Russell (1912). 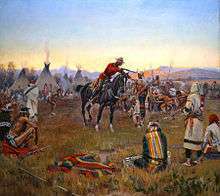 The painting depicts a lone Mounted Police Officer attempting to arrest a Blood warrior, likely in Canada. Prime Minister Sir John A. Macdonald first began planning a permanent force to patrol the North-West Territories after the Dominion of Canada purchased the territory from the Hudson's Bay Company. Reports from Army officers surveying the territory led to the recommendation that a mounted force of between 100 to 150 mounted riflemen could maintain law and order. 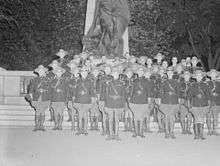 The Prime Minister first announced the force as the North West Mounted Rifles. 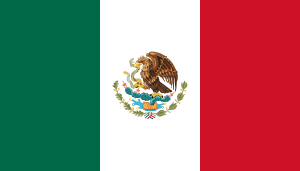 However, officials in the United States raised concerns that an armed force along the border was a prelude to a military build up. Macdonald then renamed the force the North-West Mounted Police (NWMP) when formed in 1873. 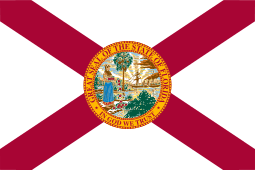 The force added "Royal" to its name in 1904. 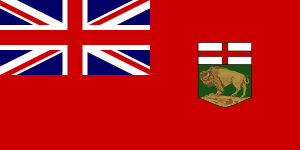 It was merged with the Dominion Police, the main police force for all points east of Manitoba, in 1920 and was renamed as the "Royal Canadian Mounted Police". The new organization was charged with federal law enforcement in all the provinces and territories, and immediately set about establishing its modern role as protector of Canadian national security, as well as assuming responsibility for national counterintelligence. As part of its national security and intelligence functions, the RCMP was responsible for infiltrating any ethnic or political groups that were considered to be dangerous to Canada's existing order. This included the Communist Party of Canada, but also a variety of minority cultural and nationalist groups. The force was also deeply involved in immigration matters, and especially deportations of suspected radicals. They were especially concerned with Ukrainian groups, both nationalist and socialist. 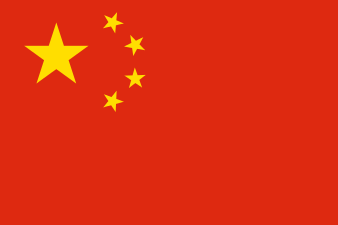 The Chinese community was also targeted because of a perceived link to opium dens. 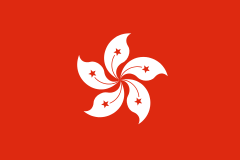 Historians estimate that fully two per cent of the Chinese community was deported between 1923 and 1932, largely under the provisions of the Opium and Narcotics Drugs Act (ONDA). Besides the RCMP's new responsibilities in intelligence, drugs enforcement, and immigration, the force also provided assistance to numerous other federal agencies, such as enforcing the residential school system for Aboriginal children. In 1935, the RCMP, collaborating with the Regina Police Service, crushed the On-to-Ottawa Trek by sparking the Regina Riot, in which one city police officer and one protester were killed. The Trek, which had been organized to call attention to the abysmal conditions in relief camps, therefore failed to reach Ottawa, but nevertheless had profound political reverberations. An RCMP Border Guards Regiment in 1943. Photo by Conrad Poirier. The RCMP employed special constables to assist with strikebreaking in the interwar period. For a brief period in the late 1930s, a volunteer militia group, the Legion of Frontiersmen were affiliated with the RCMP. Many members of the RCMP belonged to this organization, which was prepared to serve as an auxiliary force. In later years, special constables performed duties such as policing airports and, in certain Canadian provinces, the court houses. Queen Elizabeth II approved in Regina, Saskatchewan on July 4, 1973, a new badge for the RCMP, in recognition of which the force presented the sovereign with a tapestry rendering of the new design. In the late 1970s, revelations surfaced that the RCMP Security Service force had in the course of their intelligence duties engaged in crimes such as burning a barn and stealing documents from the separatist Parti Québécois, and other abuses. This led to the Royal Commission of Inquiry into Certain Activities of the RCMP, better known as the "McDonald Commission," named for the presiding judge, Mr Justice David Cargill McDonald. The Commission recommended that the force's intelligences duties be removed in favour of the creation of a separate intelligence agency, the Canadian Security Intelligence Service (CSIS). An RCMP Toyota Prius school liaison car in Ottawa. Chevrolet Tahoe RCMP SUV in Ottawa. 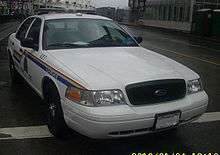 Ford Crown Victoria RCMP car in Vancouver. 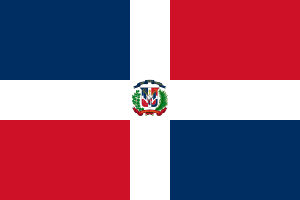 The Royal Canadian Mounted Police have been involved in training and logistically supporting the Haitian National Police since 1994, a controversial matter in Canada considering allegations of widespread human rights violations on the part of the HNP. Some Canadian activist groups have called for an end to the RCMP training. The RCMP has also provided training overseas in Iraq and other peace-keeping missions. The suspected driver of the reconnaissance vehicle involved in the Khobar Towers bombing fled to Canada where he was arrested by the Royal Canadian Mounted Police in the winter of 1997, and was extradited to the United States. Dagenais was subsequently convicted of two counts of murder and one count of attempted murder of a third Mountie who arrived shortly after the initial firefight. In 2006, the United States Coast Guard's Ninth District and the RCMP began a program called "Shiprider," in which 12 Mounties from the RCMP detachment at Windsor and 16 Coast Guard boarding officers from stations in Michigan ride in each other's vessels. The intent is to allow for seamless enforcement of the international border. On January 26, 2007, after months of negotiations between the Canadian government and Arar's Canadian legal counsel, Prime Minister Stephen Harper issued a formal apology "for any role Canadian officials may have played in what happened to Mr. Arar, Monia Mazigh and their family in 2002 and 2003" and announced that Arar would receive $10.5 million settlement for his ordeal and an additional $1 million for legal costs. On October 6, 2007, Constable Christopher John Worden of Hay River Detachment, Northwest Territories was shot and killed in Hay River while on duty in that community. A nationwide arrest warrant was issued for Emrah Bulatci. Bulatci was apprehended on October 12 in Edmonton, Alberta. On October 14, 2007, Robert Dziekański, an emigrant from Poland, died at Vancouver International Airport. Dziekański spoke no English. His mother was waiting for him outside the customs area, but she was told that her son had not arrived, and she went home. No one helped the bewildered man to clear customs. After eight hours, unable to get assistance, he became agitated. Four RCMP officers were summoned after he threw a computer and a small table. During his arrest, he was Tasered at least twice within 25 seconds of the officers' arrival. After dropping to the floor, he was held down and handcuffed by the officers. Paramedics pronounced him dead at the scene. The incident was videotaped and eventually released to the public. An official inquiry found that the officers' use of the taser was not justified. All four officers were charged with perjury regarding the confrontation; two were found guilty and sentenced to jail. On November 6, 2007, Constable Doug Scott, 20, was killed in Kimmirut, Nunavut when responding to a report of a possible impaired driver. He had been with the service for only six months. On June 3, 2013, the RCMP renamed its A Division to National Division. The RCMP are famous for their distinctive dress uniform, or "Review Order," popularly known as the "Red Serge." It consists of: high collared scarlet tunic, midnight blue breeches with yellow leg stripe, Sam Browne belt with white sidearm lanyard, oxblood riding boots (possibly with spurs), brown felt campaign hat (wide, flat brimmed) with the characteristic "Montana crease", and brown gloves (with brown leather gauntlets for riders). Review Order is worn by the mounted troop performing the Musical Ride, an equestrian drill in which mounted members demonstrate their riding skills and handling of the cavalry lance. 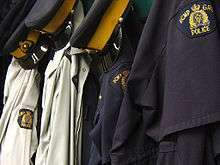 On normal duties, the RCMP uses standard police methods, equipment, and uniforms. Horses are still used for such ceremonial operations as escorting the Governor General's open landau to the Opening of Parliament. The Red Serge tunic that identified initially the NWMP, and later the RNWMP and RCMP, is of the standard British military pattern (based on the civilian Norfolk jacket). The NWMP was originally kitted out from militia stores, resulting initially in several different styles of tunic, although the style later became standardized. This style was used both to emphasize the British nature of the force and to differentiate it from the blue American military uniforms. The dark blue shoulder straps and collars were added in 1904 when King Edward VII granted the Force "Royal" status for its service in the Second Boer War, replacing the scarlet facings of the earlier uniform. Currently, RCMP personnel under the rank of inspector wear blue "gorget" patches on the collar, while officers from inspector to commissioner have solid blue collars, along with blue pointed-sleeve cuffs. On top of this jacket was worn a white haversack and white gauntlets, which provided a high visible contrast to the red tunic, but were easily dirtied. In the modern dress uniform these have been replaced with brown leather riding gloves and carrying pouches added to the belt. Reenactors portraying the NWMP K Troop. Initially the NWMP wore buff or steel grey breeches. 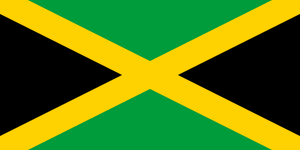 Later dark blue breeches with yellow-gold strapping (stripes) were adopted. Members of the NWMP were known to exchange kit with U.S. cavalry units along the border and it is suggested that this was the initial source for the breeches; however, blue breeches were considered early on, although with a white strap. Dark blue with yellow-gold strapping is another British cavalry tradition with yellow stripes historically being worn by most cavalry (later armoured) regiments dress uniforms. The wide, flat-brimmed Stetson hat was not adopted officially until about 1904. Although the NWMP contingent at Queen Victoria's Diamond Jubilee wore the Stetson, it was an unofficial item of dress. The primary official summer headdress at the time was the white British foreign service helmet, also known as a pith helmet. This was not particularly practical as headdress in the Canadian west, and members wore a Stetson type hat on patrol and around camp. Sam Steele is often credited with introducing the Stetson-type hat, and when he left the force to command Lord Strathcona's Horse and took the regiment to South Africa he also adopted the Stetson for this unit. For winter a Canadian military fur wedge cap or busby was worn. Black riding boots were later changed to the modern brown style called "Strathcona Boots" or informally as "high browns" (See link to Lord Strathcona's Horse). The original crossbelts were later changed to the brown Sam Browne type currently worn. The brown colour of the boots and belt worn with the Red Serge come from the individual member applying numerous coats of polish, often during their time in training at Depot Division. Original spurs, referred to as "long shank spurs" were solid nickel. Owners of long shank spurs occasionally had their regimental number engraved on the inside. The rowel was sometimes replaced with a US buffalo nickel by the wearer, as using a Canadian coin would be considered defacing the Monarch (the buffalo being associated to the Mounted Police capbadge). Long shank spurs have not been issued since 1968. The everyday uniform consists of a grey shirt with dark blue tie, dark blue trousers with gold strapping, regular patrol boots called "ankle boots," regular duty equipment, and a regular policeman's style cap. A blue Gore-Tex open-collar jacket (patrol jacket) is worn by members on operational duty, while a dark blue jacket (blue serge), is worn by sergeants major and certain non-commissioned officers (NCOs) usually involved in aspects of recruit training or media relations. Officers wear white shirts and the patrol jacket or blue serge, depending on their duties. Short-sleeved shirts with no tie are worn in the summer by all members except officers, who wear a tie with the short-sleeved shirt. Winter dress consists of a long-sleeved shirt without tie for all members except officers, who wear a tie with the long-sleeved shirt. Depending on the climate of the detachment area, heavier boots, winter coats (storm coats) and a fur cap are worn. In British Columbia the hat features a black bearskin rim belt. In 1990, Baltej Singh Dhillon became the first Sikh officer in the RCMP to be allowed to wear a turban instead of the traditional Stetson. On March 15, the federal government, despite protests, decided that Sikhs would be permitted to wear turbans while on duty as RCMP officers. Despite ongoing public pressure from groups such as the Association for the Protection of Fur-Bearing Animals, the RCMP decided against using fur but was overruled by the government and continues to use muskrat fur in their winter dress uniform. Details and history of the medal can be found by clicking on the link. Members of the force receive a Service Badge star for each five years of service, which is worn on the left sleeve. There are specialist insignia for positions such as First Aid Instructor and Dog Handler, and pilot's wings are worn by aviators. Sharpshooter badges for proficiency in pistol or rifle shooting are each awarded in two grades. On May 23, 1974, RCMP Commissioner Maurice Nadon announced that the RCMP would accept applications from women as regular members of the force. Troop 17 was the first group of 32 females at Depot in Regina on September 18 and 19, 1974 for regular training. This first all-female troop graduated from Depot on March 3, 1975. During the Second Boer War, members of the North-West Mounted Police were given leaves of absence to join the 2nd Battalion, Canadian Mounted Rifles (CMR) and Strathcona's Horse. 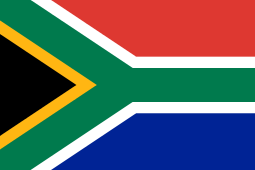 The force raised the Canadian Mounted Rifles, mostly from NWMP members, for service in South Africa. For the CMR's distinguished service there, King Edward VII honoured the NWMP by changing the name to the Royal Northwest Mounted Police (RNWMP) on June 24, 1904. In 1939, No. 1 Provost Company (RCMP), Canadian Provost Corps, was raised for service in Europe and served throughout the Second World War as military police. The Royal Canadian Mounted Police were accorded the status of a regiment of Dragoons in 1921, with its first guidon presented in 1935. 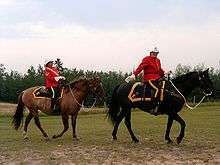 As a cavalry regiment, the RCMP was entitled to wear battle honours for its war service as well as carry a guidon. The RCMP mounted the King's Life Guard at Horse Guards Parade in 1937 leading up to the coronation of King George VI. In 1975, the RCMP dedicated a memorial beside the Fred Light Museum in Battleford, Saskatchewan, consisting of a cemetery with gate, cairn and list of honour plaque to the members of the North-West Mounted Police (1873–1904) and the Royal Canadian Mounted Police. The Royal Canadian Mounted Police is organized under the authority of the Royal Canadian Mounted Police Act. In accordance with the Act, it is headed by the Commissioner, who, under the direction of the Minister of Public Safety, has the control and management of the Force and all matters connected therewith. The RCMP formerly had many single-officer detachments in small, isolated rural communities, but in 2012 the RCMP announced that it would be closing these detachments as it moves to have all detachments with a minimum of three Mounties. The largest single RCMP detachment is in the City of Surrey in British Columbia, with over a thousand employees. Surrey has contracted with the RCMP for policing services since 1951. The second-largest RCMP detachment is in Burnaby, also in British Columbia. As of September 1, 2015, the RCMP employed 28,461 men and women, including police officers, civilian members, and Public Service Employees. The term regular member, or RM, originates from the RCMP Act and refers to the 18,988 regular RCMP officers who are trained and sworn as peace officers, and include all the ranks from constable to commissioner. They are the police officers of the RCMP and are responsible for investigating crime and have the authority to make arrests. RMs operate in over 750 detachments, including 200 municipalities and more than 600 Aboriginal communities. RMs are normally assigned to general policing duties at an RCMP detachment for a minimum of three years. These duties allow them to experience a broad range of assignments and experiences, such as responding to alarms, foot patrol, bicycle patrol, traffic enforcement, collecting evidence at crime scenes, testifying in court, apprehending criminals and plain clothes duties. 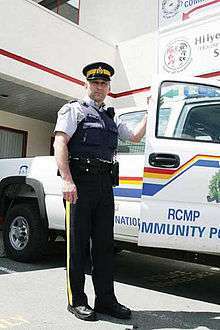 Regular members also serve in over 150 different types of operational and administrative opportunities available within the RCMP, these include: major crime investigations, emergency response, forensic identification, forensic collision reconstruction, international peacekeeping, bike or marine patrol, explosives disposal and police dog services. Also included are administrative roles including human resources, corporate planning, policy analysis and public affairs. A new designation introduced in 2014 as a replacement to the Community Safety Officers & Aboriginal Community Constables pilot programs. Community Constables are armed, paid members holding the rank of Special Constables, with peace officer power. They are to provide a bridge between the local citizens and the RCMP using their local and cultural knowledge They will mostly be focused on crime prevention, liaison with the community, and to provide resources in the event of a large-scale event. A program reinstated in 2004 in British Columbia to allow for retired, regular RCMP members or other provincially trained officers to provide extra manpower when a shortage is identified. R/Cst. are appointed under Section 11 of the Royal Canadian Mounted Police Act as paid part-time, armed officers with the same powers as regular members. However, they are not allowed to carry force-issued sidearms and use of force options unless they are called upon to duty. They generally carry out community policing roles but may also be called upon if an emergency occurs. Volunteers within their own community, appointed under provincial police acts. They are not police officers and can not identify themselves as such. However, they are given peace officer powers when on duty with a regular member (RM). Their duties consist mainly of assisting the RM in routine events, for example cordoning off crime scene areas, crowd control, participating in community policing, assistance during situations where regular members might be overwhelmed with their duties (e.g., keep watch of a backseat detainee while RM interviews a victim). They are identified by the wording of "RCMP Auxiliary" on cars, jackets and shoulder flashes. In 2008, a new pilot designation within the RCMP in British Columbia was created based on the UK Police Community Support Officer program. 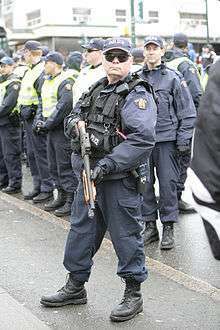 Community safety officers are paid, unarmed RCMP staff members with similar RCMP uniform but distinct shoulder badges with baton, pepper spray and handcuffs. CSOs work with regular members in five areas: community safety; crime prevention; traffic support; community policing and investigation support. They are peace officers but are not police officers. CSOs are appointed as special constable under the RCMP Act. The CSO program is scheduled to be dismantled in 2015. A pilot program that began in April 2011 where ACCs are armed, uniformed peace officers who are engaged in policing activities in their home First Nations and Inuit communities in Northwest Territories, Manitoba, Alberta, and Nunavut. Their function is to engage their communities in active crime prevention/reduction activities, and building positive relationships between their communities and the RCMP but can also provide tactical, enforcement and investigational support to core resources as a secondary function. The program is scheduled to be merged into the Community Constable program in 2015. Employees of the RCMP, they have varied duties depending on where they are deployed, but are often given this designation because of an expertise they possess which needs to be applied in a certain area. For example, an Aboriginal person might be appointed a special constable in order to assist regular members as they police an Aboriginal community where English is not well understood, and where the special constable speaks the language well. Abbreviated as "ME" they are found in RCMP detachments where a contract exists with a municipality to provide front-line policing. MEs are not actually employees of the RCMP, but are instead employed by the local municipality to work in the RCMP detachment. They conduct the same duties that a PSE would and are required to meet the same reliability and security clearance to do so. Many detachment buildings house a combination of municipal and provincially funded detachments, and therefore there are often PSEs and MEs found working together in them. The rank system of the RCMP illustrates their origin as a paramilitary force. The insignia were based upon the Canadian Army/British Army. of the time, which is almost identical to that of the current Canadian Army. Higher ranks have been increased over the years since the formation of the force, whereas the rank of inspector, which was initially a subaltern, is now a field officer level, the lower officer ranks having been dropped. With the military introducing the warrant officer, the RCMP non-commissioned officers were maintained using the older military style. The ranks of inspector and higher are commissioned ranks and are appointed by the Governor-in-Council. Depending on the dress, badges are worn on the shoulder as slip-ons, on shoulder boards, or directly on the epaulettes. The lower ranks are non-commissioned officers and the insignia continues to be based on British army patterns. Since 1990, the non-commissioned officers' rank insignia has been embroidered on the epaulette slip-ons. Non-commissioned rank badges are worn on the right sleeve of the scarlet/blue tunic and blue jacket. The constables wear no rank insignia. There are also Special Constables, Reserve Constables, Auxiliary Constables, and Students who wear identifying insignia. The Bath star represents the military Knight Grand Cross of the Order of the Bath. The RCMP is responsible for policing in Canadian Internal Waters, including the territorial sea and contiguous zone as well as the Great Lakes and Saint Lawrence Seaway; such operations are provided by the RCMP's Federal Services Directorate and includes enforcing Canada's environment, fisheries, customs and immigration laws. In provinces and municipalities where the RCMP performs contract policing, the force is also responsible for policing on freshwater lakes and rivers. To meet these challenges, the RCMP operates what is known as the Marine Division, with five Robert Allan Ltd.–designed high-speed catamaran patrol vessels; Inkster and the Commissioner-class Nadon, Higgitt, Lindsay and Simmonds, based on all three coasts and manned by officers specially trained in maritime enforcement. Inkster is based in Prince Rupert, BC, Simmonds is stationed on the south coast of Newfoundland, and the rest are located on the Pacific Coast. Simmonds sports the RCMP badge, but is otherwise painted with Canadian Coast Guard colours and the marking Coast Guard Police. The other four vessels are painted with blue and white RCMP colours. The RCMP owns and operates 377 smaller boats at various locations across Canada, this number comprising all vessels less than 9.2 m (30 ft) long. This category ranges from canoes and car toppers to rigid-hulled inflatables and stable, commercially built, inboard/outboard vessels. Individual detachments often have smaller high-speed rigid-hulled inflatable boats and other purpose-built vessels for inland waters, some of which can be hauled by road to the nearest launching point. Royal Canadian Mounted Police Cessna Caravan on floats at Vancouver International Airport. As of May 2014 the RCMP had 40 aircraft (9 helicopters and 31 fixed-wing aircraft) registered with Transport Canada (TC). with 41 listed on the RCMP Air Services website, excepting the Quest Kodiak. All aircraft are operated and maintained by the Air Services Branch. Only the Twin Otter and the Avanti are twin-engine aircraft, all the others, including the helicopters, are single engine. Aérospatiale AS350 7 8 AS 350B3 Helicopter, AStar 350 or "Squirrel"
Eurocopter EC120 Colibri 2 2 EC 120B Light helicopter, "Hummingbird"
Piaggio P180 Avanti Avanti 0 0 P180 Fixed wing, business aircraft, pusher configured. Sold on July 17, 2014. Other than the Cessna Caravans the RCMP just list 10 Cessna. Fabrique Nationale (FN) C1A1 variant of the L1A1 and FN FAL produced under licence by Canadian Arsenals Limited (CAL) (Long Branch). In 1973, Wilkinson Sword produced a number of commemorative swords to celebrate the RCMP centennial. None of these swords were ever used ceremonially, and were strictly collectibles. Wilkinson Sword also made a commemorative centennial tomahawk and miniature "letter opener" models of their centennial swords. Winchester Repeating Arms Company produced an RCMP commemorative centennial version of their Model 94 rifle in .30-30 calibre. Serial numbers with the prefix "MP" were sold to serving RCMP members. A collection of RCMP souvenirs from around Canada. A former Mounted Police corporal (1919–1923), Bruce Carruthers, served as an unofficial technical advisor to Hollywood in many films with RCMP characters. 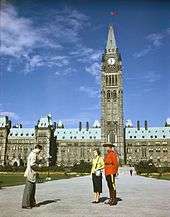 In 1959, the Canadian Broadcasting Corporation aired R.C.M.P., a half-hour dramatic series about an R.C.M.P. detachment keeping the peace and fighting crime. Filmed in black and white, in and around Ottawa by Crawley Films, the series was co-produced with the BBC and the Australian Broadcasting Corporation and ran for 39 episodes. 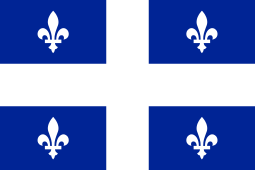 It was noted for its pairing of Québécois and Anglo officers. The Mounties on parade in Iqaluit, Canada Day, 1999. The 1972–90 CBC series The Beachcombers featured a character named Constable John Constable who attempted to enforce the law in the town of Gibsons, British Columbia. In comic books, the Marvel Comics characters of Alpha Flight were described on several occasions as "RCMP auxiliaries," and two of their members, Snowbird and the second Major Mapleleaf were depicted as serving members of the force. In the latter case, due to trademark issues, Major Mapleleaf was described as a "Royal Canadian Mountie" in the opening roll call pages of each issue of Alpha Flight he appeared in. The 1998 swan song of Nick Berry's time on UK drama Heartbeat featured his character, Sergeant Nick Rowan, transferring to Canada and taking the rank of constable in the Mounties. The special telemovie was titled Heartbeat: Changing Places. The 1994–98 TV series Due South paired a Mountie (and his deaf half-wolf) with a streetwise American detective cleaning up the streets of Chicago, mainly deriving its entertainment from the perceived differences in attitude between these two countries' police forces. A pair of Mounties staffed the RCMP detachment in the fictional town of Lynx River, Northwest Territories, in the CBC series North of 60. The series, which aired from 1992 to 1998, was about events in the mostly native community, but the Mounties featured prominently in each episode. Another TV series from the 1990s, Bordertown featured a NWMP corporal paired with a U.S. marshal securing law and order on a frontier U.S.-Canada border town. In the ABC TV mini-series Answered by Fire, at least three mounties are featured. The 1987 Brian De Palma film The Untouchables featured cooperation between the Treasury Department task force, led by Eliot Ness, and the Mounties against liquor smuggling across the Canada–United States border. In his 1999, album Soiree Newfoundland musician A. Frank Willis included "Savage Cop in Savage Cove" which was based on a true story & went on to become a big hit. From 2011, the CTV fantasy drama series "The Listener" began to regularly feature characters who worked for the Integrated Investigative Bureau, a fictional division of the R.C.M.P. 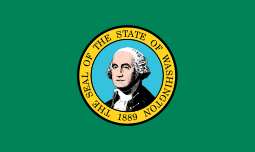 that brought together various specialists, officers and civilian consultants to work on high profile or federal cases. Although characters in the employ of the IIB were rarely, if ever, depicted wearing uniform, they were often addressed by their ranks - two main characters were Sergeant Michelle McClusky and Corporal Dev Clark. The RCMP Heritage Centre is a multi-million dollar museum designed by Arthur Erickson that opened May 2007 in Regina, Saskatchewan at the RCMP Academy, Depot Division. It replaced the old RCMP museum and is designed to celebrate the role of the force in Canada's history. The Royal Canadian Mounted Police received an international license on April 1, 1995, requiring those who use the RCMP to pay a licensing fee. Proceeds from the fees is used for community awareness programmes. 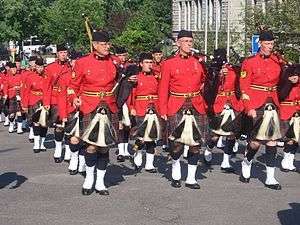 Those that do not pay the licensing fee are legally unable to use the name of the RCMP or their correct uniforms, though a film such as Canadian Bacon used the name "Royal Mounted Canadian Police" (RMCP) and the character in the Dudley Do-Right film did not wear accurate insignia. 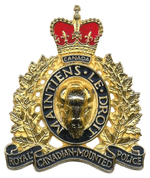 Through a Master Licensing Agreement (MLA) with the Royal Canadian Mounted Police, the RCMP Foundation is responsible for managing the commercial use of the RCMP name, image, and protected marks. The Foundation issues selected companies a royalty-based agreement allowing them to produce and market high quality official RCMP merchandise. Walt Disney Co. (Canada) Ltd. was contracted to aid in the initial set up of the Licensing Program but contrary to popular belief, Disney never owned or controlled any of the RCMP's protected marks. Following the expiration of the Disney contract in 2000, all responsibilities and activities were taken over by the then Executive Director and his staff, reporting to the Foundation President and Board of Directors. In 2007, through a decree signed by Commissioner Beverley Busson, the operating name was changed to the Royal Canadian Mounted Police Foundation. 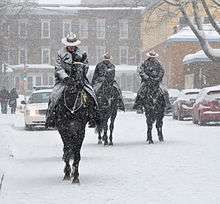 American historian Andrew Graybill has argued that the Mounted Police closely resemble the Texas Rangers in many ways. He argues that each protected the established order by confining and removing Indians, by tightly controlling the mixed blood peoples (the African Americans in Texas and the Métis in Canada), assisted the large-scale ranchers against the small-scale ranchers and farmers who fenced the land, and broke the power of labor unions that tried to organize the workers of industrial corporations. Alberta Law Enforcement Response Teams, an integrated unit on the provincial and municipal level that involves "K Division"
1 2 "Royal Canadian Mounted Police - Badges and Insignia". Rcmp-grc.gc.ca. February 16, 2005. Retrieved May 22, 2010. 1 2 3 "Royal Canadian Mounted Police". Quebec400.gc.ca. February 8, 2008. Archived from the original on July 16, 2008. Retrieved May 22, 2010. ↑ "History of the RCMP". Royal Canadian Mounted Police. Retrieved 2016-04-14. ↑ "Auxiliary Constable Program". Royal Canadian Mounted Police. Retrieved 2016-05-05. ↑ "New RCMP National Headquarters Building: The M.J. Nadon Government of Canada Building". Royal Canadian Mounted Police. 2011-10-05. Retrieved 2016-04-11. 1 2 3 4 5 6 7 8 "Organization of the RCMP". Rcmp-grc.gc.ca. September 1, 2015. Retrieved March 24, 2016. ↑ "Find a detachment". Royal Canadian Mounted Police. 2016-05-06. Retrieved 2016-05-07. ↑ "About the RCMP". Rcmp-grc.gc.ca. April 26, 2016. Retrieved May 7, 2016. 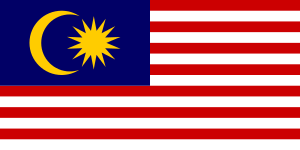 ↑ "Trade-marks Act". Laws.justice.gc.ca. May 18, 2010. Archived from the original on June 5, 2011. Retrieved May 22, 2010. ↑ "Inquiry Into Certain Activities of the Royal Canadian Mounted Police, Royal Commission of," Canadian Encyclopedia. Retrieved August 26, 2007. ↑ The Royal Collection. "e-Gallery > Exhibitions > Queen & Commonwealth > Gifts > Badge of the Royal Canadian Mounted Police". Queen's Printer. Retrieved July 26, 2009. ↑ CBC Archived May 20, 2007, at the Wayback Machine. ↑ "RCMP chief apologizes to Arar for 'terrible injustices'". Cbc.ca. September 28, 2006. Retrieved May 22, 2010. 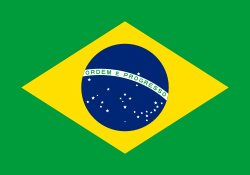 ↑ "6 November 2007". Ctv.ca. November 6, 2007. Retrieved May 22, 2010. ↑ Canoe.ca News December 25, 2007 Archived February 25, 2008, at the Wayback Machine. ↑ "RCMP National Division, a renamed A Division, to take on corruption". Maclean's. 2013-06-03. Retrieved 2013-10-25. ↑ Gil Aegerter. "Three Canadian Officers Killed in Spray of Gunfire". NBC News. ↑ Associated Press in Moncton. "Canadian police charge suspect over shooting deaths of three Mounties". Theguardian.com. Retrieved 2014-06-07. ↑ "First-degree murder charges laid in deaths of 3 Moncton RCMP officers". Ctvnews.ca. 2013-06-06. Retrieved 2014-06-07. ↑ "Moncton shooting: RCMP release names of 3 slain officers". CBC.ca. 2014-06-05. Retrieved 2014-06-06. 1 2 3 North West Mounted Police Uniform - Royal Canadian Mounted Police. Rcmp-grc.gc.ca (2011-08-12). Retrieved on 2014-04-12. ↑ Ross, David. The Royal Canadian Mounted Police 1873 -1987. p. 36. ISBN -0-85045-834-X. ↑ RCMP Hats. Furbearerdefenders.com. Retrieved on 2013-10-30. ↑ Moore, Dene. 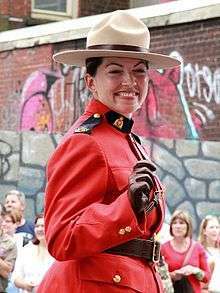 (2012-08-16) Female Mounties earn right to wear pants and boots with all formal uniforms. Vancouversun.com. Retrieved on 2014-04-12. ↑ "William Elliott sworn in as RCMP commissioner". CBC News. July 16, 2007. Retrieved July 30, 2008. ...the organization's first chief not to have served on a police force. ↑ Vancouver, The (December 7, 2006). "New commissioner for RCMP must restore faith in the famed force". Canada.com. Retrieved May 22, 2010. ↑ "Royal Canadian Mounted Police". Archived from the original on October 13, 2007. ↑ North-West Mounted Police memorial Archived May 17, 2013, at the Wayback Machine. ↑ "Fact Sheet: International Operations Branch" (PDF). Royal Canadian Mounted Police. Retrieved April 28, 2010. 1 2 "RCMP Police Dog Service Training Centre". Archived from the original on June 25, 2008. ↑ National Division - Royal Canadian Mounted Police. Rcmp-grc.gc.ca (2013-10-17). Retrieved on 2013-10-30. 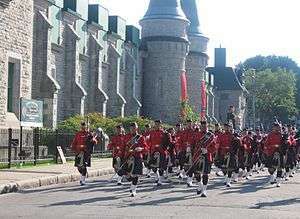 1 2 "The RCMP in Quebec". 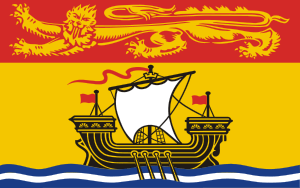 ↑ "RCMP in Nova Scotia". ↑ "RCMP - Yukon (M Division)". Archived from the original on February 5, 2009. ↑ Renato Gandia, RCMP pays tribute to wives who supported officers posted to smallest detachments, Calgary Sun (April 12, 2013). 1 2 B.C. 's single-officer RCMP detachments to be closed, CBC News (September 28, 2012). ↑ Your Surrey RCMP, Royal Canadian Mounted Police (last modified March 31, 2016). ↑ Canada's second largest RCMP detachment integrates dispatch with E-Comm Regional communications centre (press release), E-Comm (October 2, 2013). ↑ Switched on - Blue Line. Blueline.ca. Retrieved on 2013-10-30. ↑ Tightened tactics breed dissent in Harper’s security detail. The Globe and Mail (2012-06-23). Retrieved on 2013-10-30. 1 2 "Auxiliary Constable Program". ↑ "News". January 6, 2016. 1 2 "Community Constable Program (Synopsis)". ↑ "Community-level knowledge sought in new RCMP program". ↑ "Community constables link citizens and police". Thompson Citizen. 1 2 3 "RCMP Reserve Program". Rcmpvetsnb.ca. January 1, 1995. Archived from the original on 2009-06-05. Retrieved May 22, 2010. ↑ RCMP Reserve Constables in B.C. 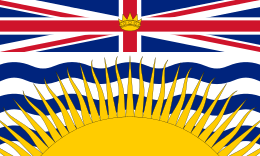 ↑ "New category of RCMP member a first for British Columbia". Bc.rcmp.ca. July 5, 2008. Retrieved May 22, 2010. ↑ Surrey RCMP. 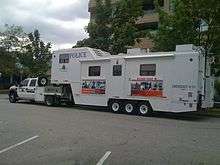 "Surrey RCMP - CSO Program". 1 2 3 "Community Safety Officer Pilot Program Evaluation Report". 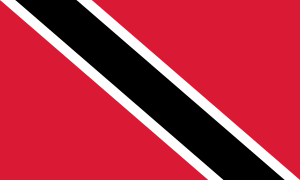 ↑ "Telecommunications Operators". rcmp-grc.gc.ca. July 30, 2010. Retrieved September 1, 2010. ↑ "Royal Canadian Mounted Police (RCMP¨) / Royal Canadian Mounted Police (RCMP) / Gendarmerie royale du Canada (GRC)". ↑ "Land Transport". Rcmp-grc.gc.ca. November 14, 2006. Retrieved May 22, 2010. 1 2 "Marine Services". Rcmp-grc.gc.ca. Retrieved May 22, 2010. ↑ "RCMP sells sleek plane for half of asking price". July 24, 2014. ↑ Phillips, Roger F., & Klancher, Donald J. Arms & [sic] Accoutrements of the Mounted Police 1873-1973 (Bloomfield, ON: Museum Restoration Service, 1982), p.24. ↑ "Newfoundland music books food videos images arts crafts". ↑ Farnsworth, Clyde H. (February 4, 1995). "For the Mounties, Justice Is Now a Licensing Fee—New York Times". New York Times. Retrieved May 22, 2010. ↑ Harris, Kathleen. "RCMP could pay up to $100M to female employees who were sexually harassed, abused". CBC News. Retrieved 6 October 2016.